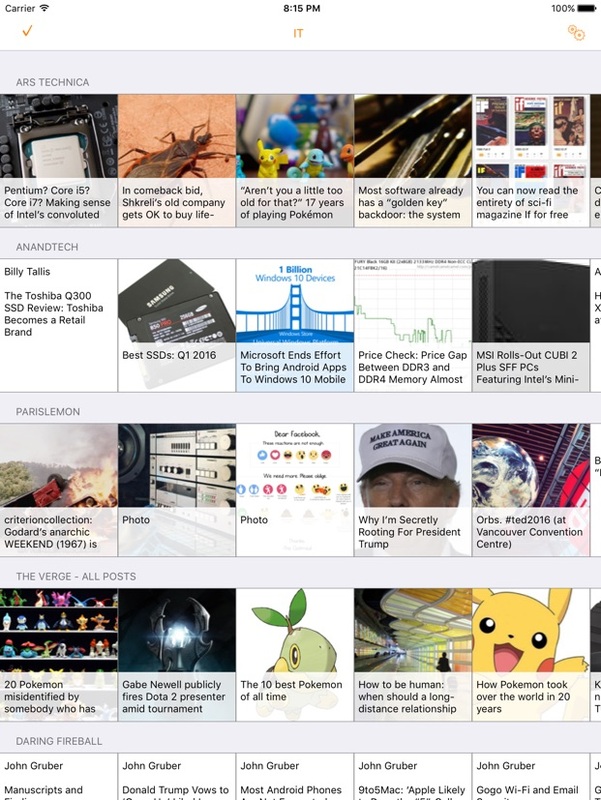 This view scrolls both horizontally and vertically, showing all the news items for your subscribed feeds. To read an item, simply click it, and if you want to jump directly to the linked web page, long-click the item; see below for further details on reading. Long-click the feed’s name to copy the feed address to the clipboard, in case you want to e.g. send the address to someone else. A gray background indicates that the item has been read. To mark all items as read, click the ✓-button in the top left. If you click this button by accident, you can click it again and it will “de-mark” those items (this only works while you are looking at the same group of feeds, and until you have refreshed those feeds). Note that if you haven’t bought the upgrade for unlimited feeds, you will only see at most 3 feeds in this view. You can add more feeds to your feed list but only the top 3 will be shown in the grid. To buy the upgrade, go to the settings (the small cogwheel to the top right). 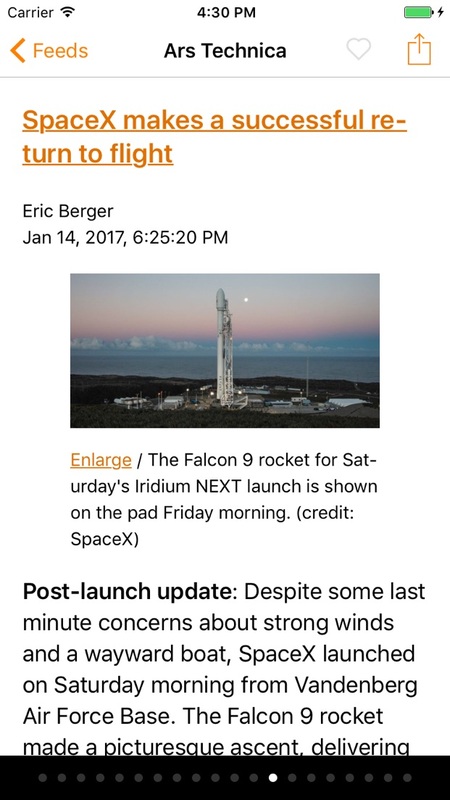 This view presents the context of the actual RSS item, formatted for efficient reading. Here you can swipe to move between the items in the feed, or if you prefer, click on the navigation bar at the bottom. All items you read will be marked as read in the main grid view. Note that on iPads this window will be shown atop the main view. 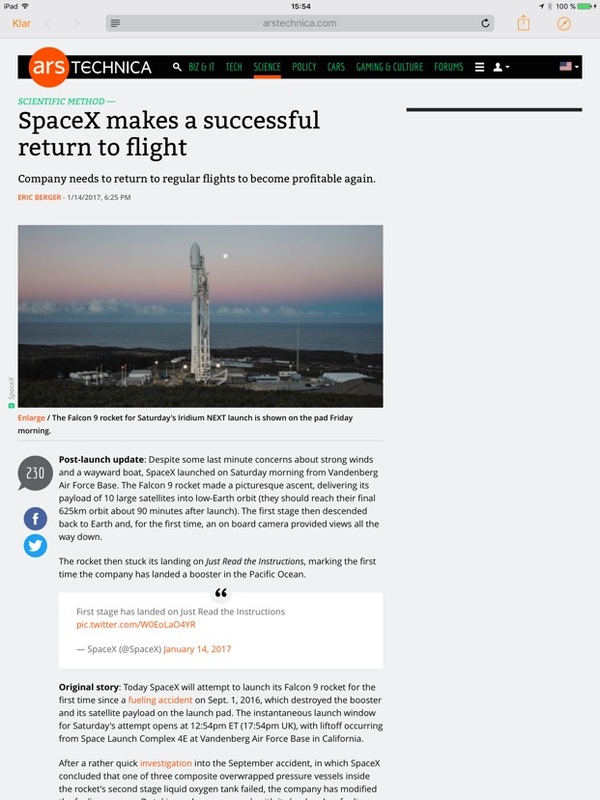 Also, as mentioned previously, if you want to jump straight to the web page for a news item, you can long-click the item in the main view. So day-to-day usage is very straightforward: Click, read, swipe. Personally, I always end my session with clicking on the All read-button so I know that next time, all ”white” items are new to me.